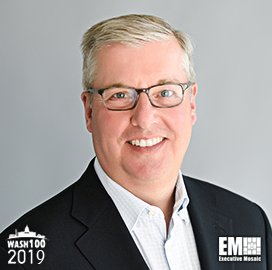 Executive Mosaic is honored to name Michael Corkery, president and CEO of Deltek, as an inductee into the 2019 Wash100 — Executive Mosaic’s annual selection of the most influential voices in the government contracting arena — for his efforts to improve Deltek’s enterprise software, information and consulting services. This marks Corkery’s second Wash100 award. To expand its services for customers worldwide, the company in 2018 integrated its GovWin IQ government contracting data platform with state, local and educational market intelligence data from Onvia. Deltek said GonWin+Onvia will help government contractors explore the latest information on business opportunities across the federal, state, local and education sectors. “The GovWin IQ business is a critical part of our strategy to help project-based businesses grow and succeed,” Corkery said. The effort comes after Deltek released an analysis in early 2018 showing that the Department of Defense wants to provide up to $2.4B per year through fiscal year 2022 to build or acquire new technologies for the military. DoD also planned to invest in artificial intelligence, machine learning and autonomous platforms, among other technologies included in the 2018 National Defense Strategy. In September, the U.S. Navy released a solicitation for the potential end-user hardware portion of the Next Generation Enterprise Network Recompete contract. Deltek estimates the Space and Naval Warfare Systems Command will award a single indefinite-delivery/indefinite-quantity contract worth nearly $250M with a three-year base term and six option years. Corkery acts as the driving force behind Deltek’s mission of delivering superior enterprise software, information solutions and consulting services to over 23,000 customers across 80 countries. He joined the company in 2010 as CFO and served in the role until he became CEO in Dec. 2012. Prior to his time with Deltek, Corkery was CFO and the acting CEO for ICO Global Communications. He was also the CFO for Current Group and Berliner Communications. He has served as the vice president of Operation Finance with Nextel Communications and for AT&T Wireless’ Business Planning & Analysis division. Corkery serves as a board member for the Year Up National Capital Region and the Northern Virginia Technology Council. He’s also an executive committee member for the Leukemia & Lymphoma Society’s National Capital Region Light the Night Walk amd the Board of Trustees for Flint Hill School in Oakton, Va.